A healthy caramel pumpkin dip that is vegan, gluten free and dairy free. 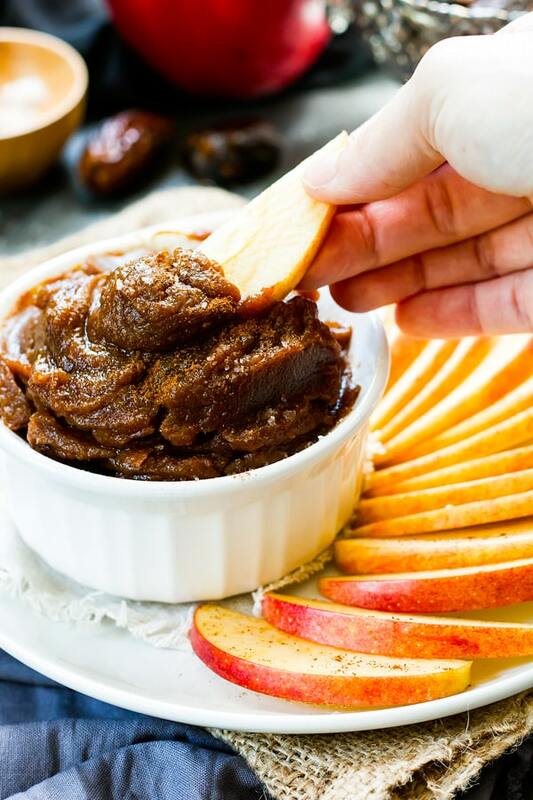 Pumpkin puree, spices and dried dates come together to make this tasty Fall dip that is perfect for parties. Have you ever had a date caramel? And how about one with pumpkin puree and Fall spices? This Caramel Pumpkin Dip is exactly what you need at your upcoming Fall party. Not only is it extremely tasty, but it is also vegan, dairy-free, refined sugar-free and of course, gluten-free. Serve it with some thinly sliced apples and you will have your guests’ appetites appeased for the first hour of your get-together! Watch the Video Below to see how quickly this Healthy Caramel Pumpkin Dip comes together! Or you can check it out on YouTube by clicking here. Last week Cohl and a bunch of our friends ran a race called the Zilker Relays. It is at a park in the center of Austin and held on a Friday evening after work. Teams of four are gathered to run a total of 10 miles – 2.5 miles each. Man can my friends eat!! Before I knew it, the dip was nearly gone. 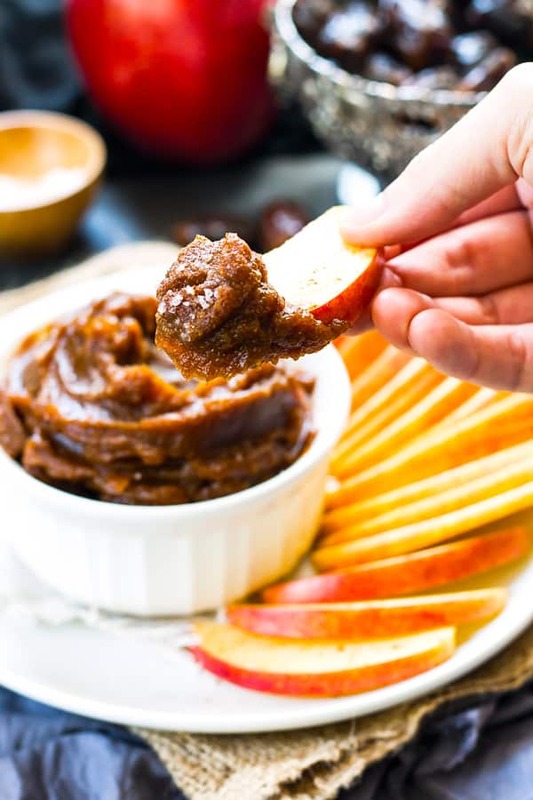 One of our good friends was so stoked about this dip (he is super active and always on top of his nutrition game) that he came up with many different ways in which you can enjoy this Pumpkin Caramel Dip. One of my favorite suggestions of his is to treat it more like a Pumpkin Butter. You can serve it on toast, waffles, pancakes, or even a banana. Seriously… the possibilities are endless! What Fall parties do you have coming up? I would love to hear about them in the comments section below! Until next time, Happy Caramel Pumpkin Dippin’!! In the bowl of a food processor place dates and water. Pulse until ingredients start to combine and water does not splatter. Puree for 2 minutes, scraping down the sides of the bowl every 30 seconds. Add pumpkin and maple syrup. Puree for 2-3 minutes, scraping the sides of the bowl every 30-45 seconds. Lastly, add cinnamon, spice, vanilla and salt. Puree for 2-3 minutes, scraping down the sides of the bowl every 30-45 seconds. Note: The longer you puree, the warmer the dip will get. 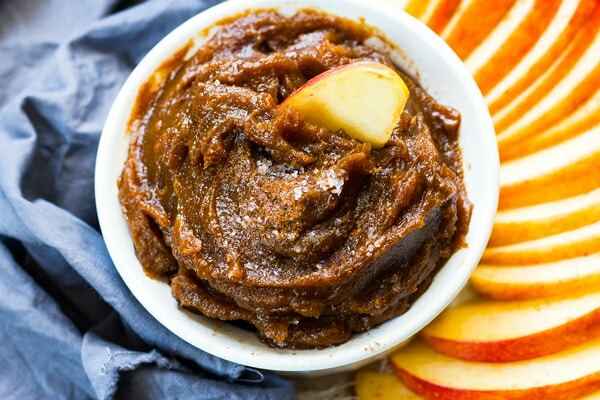 Serve Pumpkin Caramel Dip with sliced apples, pears, pretzels or graham crackers and enjoy! 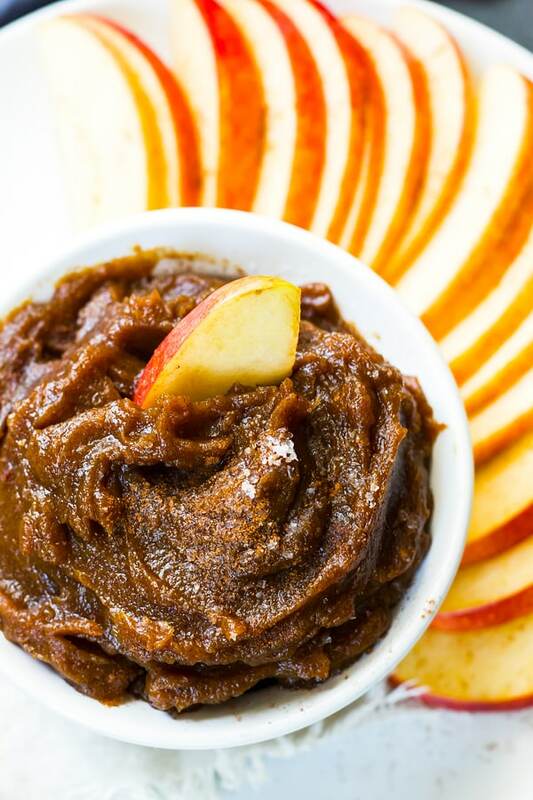 Want more recipes like this Healthy Caramel Pumpkin Dip? 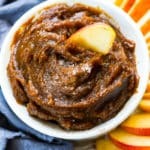 I used to think date caramel was the best thing ever, until I discovered this date caramel pumpkin dip! Seriously drooling! It seriously is!! It tastes so incredible with apples, too 🙂 Making it a wonderful Fall treat!